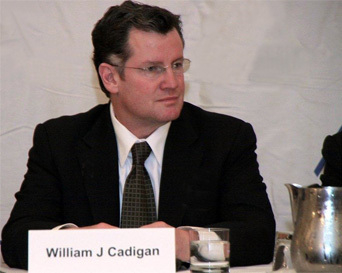 WILLIAM J. CADIGAN is principal in the Law Office of William J. Cadigan, P.C. located in Chicago, Illinois. He is also a consultant with the law firm of Akin, Gump, Strauss, Hauer & Feld L.L.P. in Washington D.C.
Bill Cadigan formerly served as Chairman of the Board of Directors of the Chicago Technology Park, an incubator and multi-tenant facility for emerging companies in the field of biotechnology, genomics and pharmaceutical production. From 1999 to 2005, Mr. Cadigan served as a Commissioner of the Illinois Medical District. Located on Chicago’s Near West Side, the Illinois Medical District includes 560 acres of hospitals, medical research facilities, universities, and over 40 healthcare related facilities. Before entering law school, Bill Cadigan worked on Capitol Hill as an aide for Congressman John E. Porter (10th-IL), handling appropriations, health care, education and other domestic policy issues. Prior to entering private practice, Bill Cadigan served as an Assistant State's Attorney in Lake County, Illinois and as in-house counsel for Metra, the commuter rail agency for northeastern Illinois. He is admitted to practice before the Illinois Supreme Court, the U.S. District Court for the Northern District of Illinois and the U.S. Court of Appeals for the Seventh Circuit. Bill Cadigan is a member of the American Health Lawyers Association, the Illinois Association of Healthcare Attorneys, and the Chicago Bar Association. He has served as a guest lecturer and moot competition judge at the Loyola University Chicago School of Law Institute for Health Law and also a contributing author/editor to The Law of Medical Practice in Illinois, 3rd Edition (West Group), and Representing Physicians Handbook, 2nd Edition (American Health Lawyers Association). In addition to his law practice, Bill has been a leader in promoting causes dedicated to eliminating the culture of corruption in Illinois. In the wake of the Blagojevich scandals, Bill’s work on reform was recognized in the final report issued by the Illinois Reform Commission, an independent body empanelled to examine government practices and ethics, and make recommendations for cleaning up state government. In 2014, Bill was Transition Co-Counsel to Illinois Governor Bruce Rauner. In this role, he advised senior members of the incoming administration on a wide range of issues related to Illinois ethics, procurement, and constitutional law. Governor Rauner subsequently nominated Bill to serve as a member of the State Board of Elections and he was unanimously confirmed by the Illinois State Senate in 2015. Bill has competed in and finished 8 marathons, and in his spare time is an avid bicyclist, reader, and lifelong aspiring guitar player. He received a Bachelor of Arts degree from Eastern Illinois University and a Juris Doctorate from the John Marshall Law School.